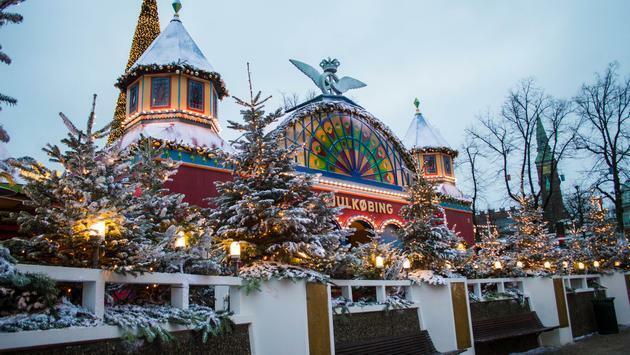 On any given day of the year, Tivoli Gardens is the epitome of enchanting. A mix of nostalgic vintage rides and modern thrillers, fine dining and top-notch entertainment—all surrounded by lovely landscaping—Tivoli is an iconic destination. But dust Denmark’s most beloved amusement park in a blanket of snow and throw in some elves, and you’ve got yourself holiday heaven. This grand dame pulls out all the stops for the Christmas season, and here are just a few of the things you can expect to see if you head for Copenhagen this time of year. Upon gliding under the arch of the park’s palatial entryway, you are immediately surrounded by a distinctly Scandinavian atmosphere. Traditional wooden huts—home to traders selling seasonal fare and gifts from the North—are surrounded by a forest of twinkling trees. And if you peer through the panes of a workshop-type building behind the trees, you will spot Santa Claus—known as the Juleman in Denmark—holding court with the kids. One of the most serene spots in Tivoli Gardens, Tivoli Lake is a placid pond at the center of the park. Here you will find Faergekroens Brewery—a great place to sip a seasonal Danish Christmas beer—and the Honey Cake Castle hidden near its shores. This Candyland-esque cafe is the best place for visitors to escape the cold and warm up with one of Denmark’s most beloved yuletide treats: the honey cake. These are a heart-shaped, spiced soft cake covered in chocolate. In addition to observing the world’s only elf-run honey cake machine (wink, wink), you can even decorate your own. In the heart of the park, you will find Trainsbury—a faux Danish train depot that has been completely decked out for the season. While the actual station may be a recreation, that doesn’t mean you aren’t in for an adventure when you step inside. 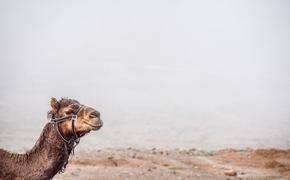 There you will find a cozy bar pouring mulled wine and two full rows of authentic train seats placed under a series of flatscreen televisions showing nothing but snowy landscape scenes whizzing by. Sit down, relax and be whisked away on the Danish Polar Express. You would be hard-pressed to find a slice of Tivoli Gardens that wasn’t soaked in Christmas Spirit. 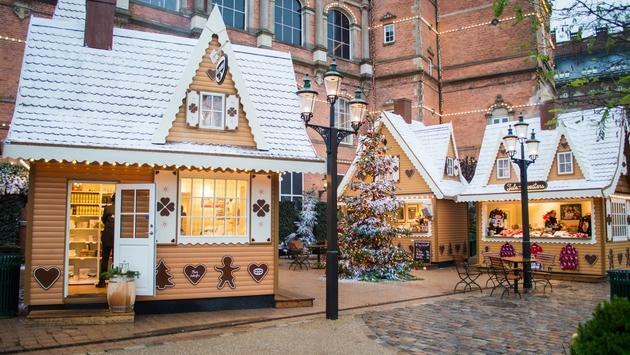 Dozens of dazzling Christmas trees have been placed around the park, “snow” covers nearly every surface and almost every walkway is lined with stalls selling festive goodies. Heck, even the horses on the iconic old-fashioned skill game Galoppen sport Santa hats during the season. Throw in nightly Christmas illuminations on the lake—and the fact that the park is hosting ELF-The Musical this year—and your yuletide dreams just came true in Copenhagen. 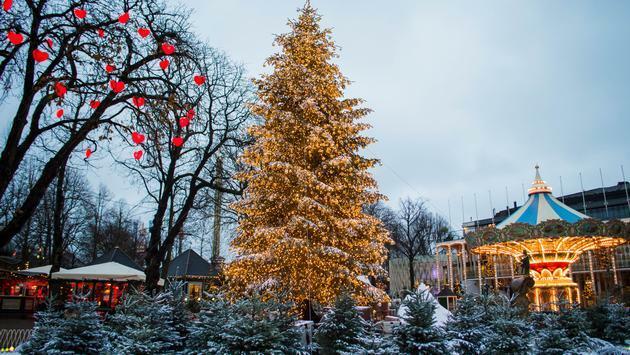 Christmas at Tivoli Gardens runs until December 31st.